Every year the City of Dublin recognizes active, impactful and inspirational volunteers. 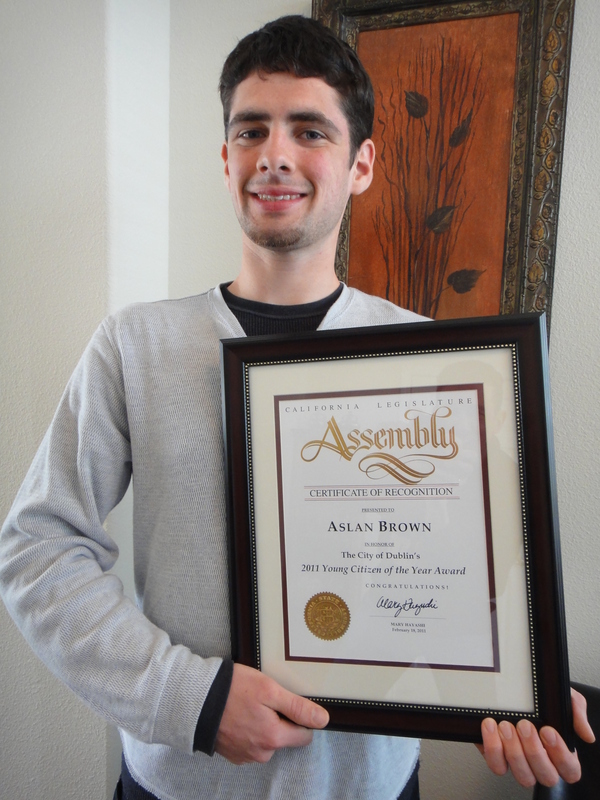 For 2010, Dublin High School senior Aslan Brown was nominated and awarded Young Citizen of the Year for his extensive volunteer activities in support of the City of Dublin and Dublin youth. Aslan is currently Committee Chairperson of Dublin’s Youth Advisory Committee, was responsible for the Youth Fee Assistance Program (which helps underprivileged children participate in city events) and is an active participate in numerous other events including Dublin’s annual St. Patrick’s Day Festival, the Teen Job Fair and has worked with the Lions Club on Dublin Pride Week. OneDublin.org recently met with Aslan and his family to learn more about how Aslan balances high school and volunteering. Aslan’s advice for students entering high school is simple – “be involved”, take advantage of everything Dublin High has to offer and take school seriously right from 9th grade. Aslan was named after the lion from “The Lion, the Witch and the Wardrobe” by C.S. Lewis. “Aslan” is also Turkish for “lion” (Aslan’s mother who is of Turkish descent). Congratulations Aslan for living up to the leadership qualities characteristic of your namesake! The full text of Aslan’s nomination is available here. James: Thank you for highlighting the achievements of Aslan. Your committment to showing the positive stories from our youth and community provide a positive reinforcement for continuous improvement. Aslan is one of the nicest, most polite “teenagers” I have ever known! So wonderful to have him honored in this way!! He certainly deserves it! BRAVO!! I can’t agree more with the choice of Aslan as Young Citizen of the Year. He’s a terrific role model for the youth of our community. Congratulations Aslan!!! Thank you Cindy, Thank you Ken for your sentiments – we all are very privileged to be living in such a great community and knowing such extraordinary individuals like yourselves and your children. Congratulations on Ben’s acceptance to West Point as well! Congrats Aslan, remember it’s not all work, must take time to “Party now and then” Know your folks are very proud of you!